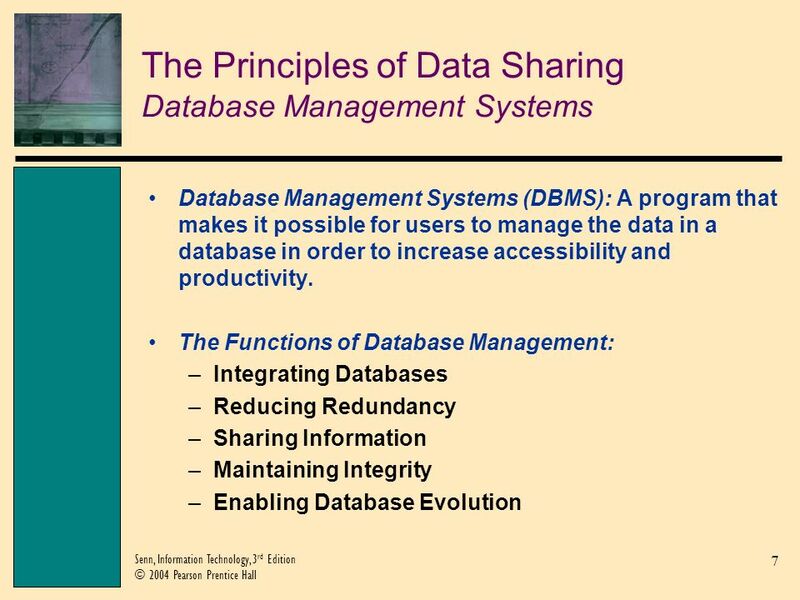 2 2 Senn, Information Technology, 3 rd Edition © 2004 Pearson Prentice Hall Objectives Identify the reasons organizations choose to share databases and the functions of a database management system. 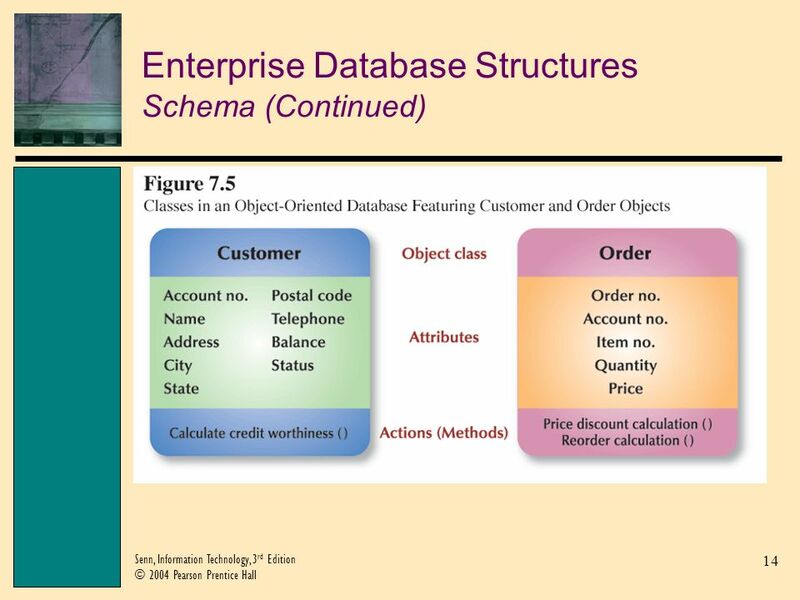 Explain the difference between relational and object-oriented databases and their uses in business. 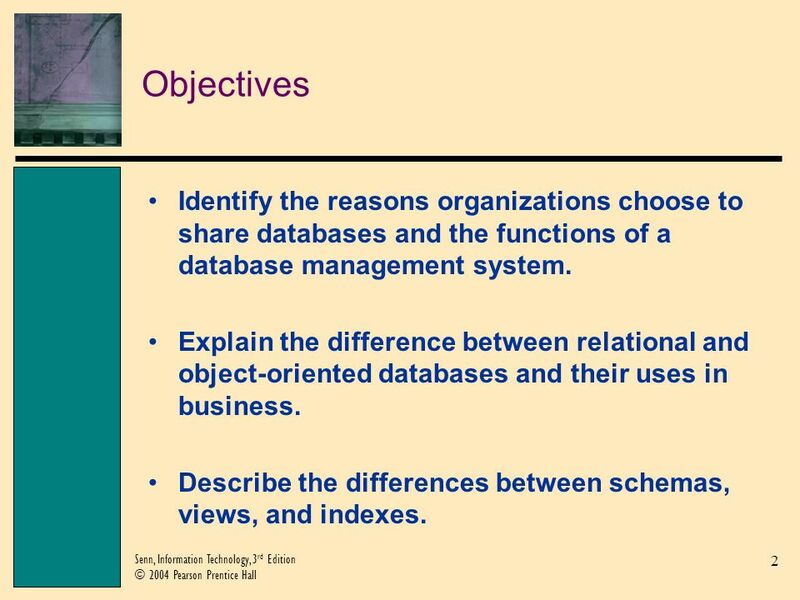 Describe the differences between schemas, views, and indexes. 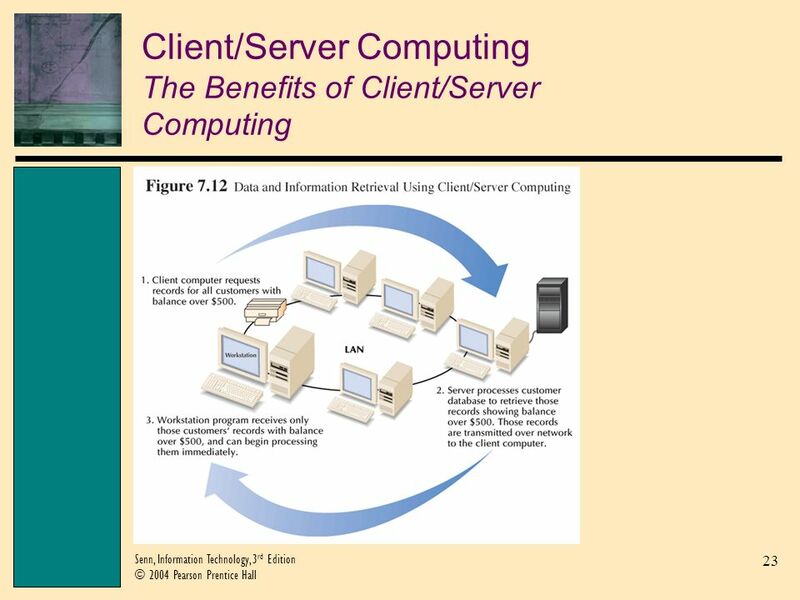 3 3 Senn, Information Technology, 3 rd Edition © 2004 Pearson Prentice Hall Objectives (Continued) Discuss the benefits of client/server computing. 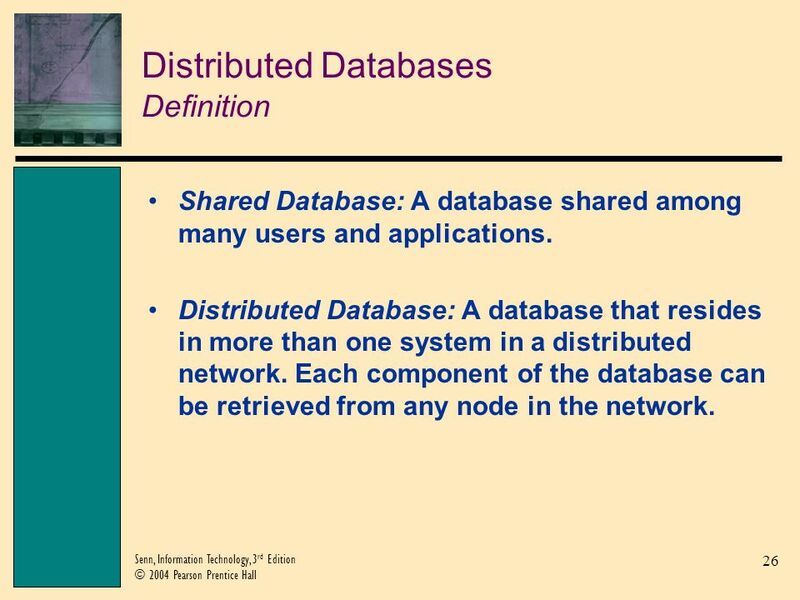 Differentiate between shared and distributed databases. 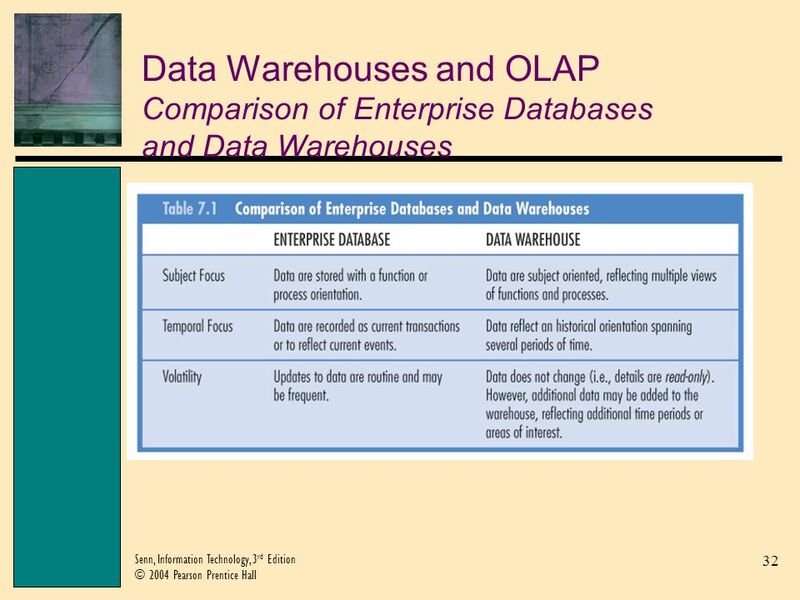 Explain why enterprises establish data warehouses and how they differ from data marts and enterprise databases. 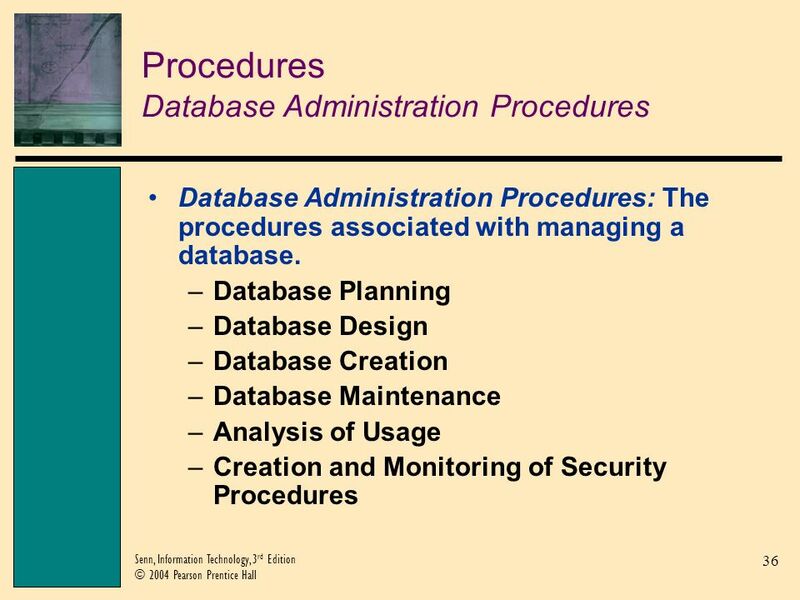 4 4 Senn, Information Technology, 3 rd Edition © 2004 Pearson Prentice Hall Objectives (Continued) Distinguish between a database administrator and a system programmer. 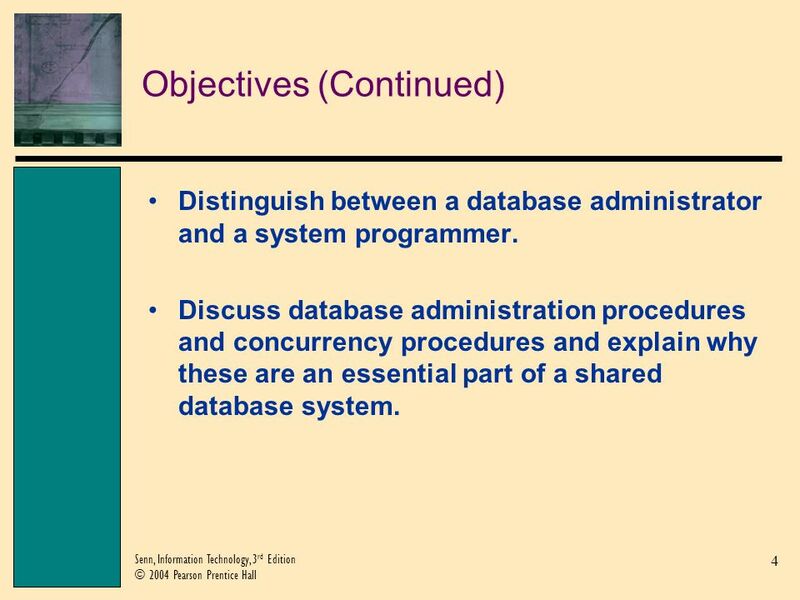 Discuss database administration procedures and concurrency procedures and explain why these are an essential part of a shared database system. 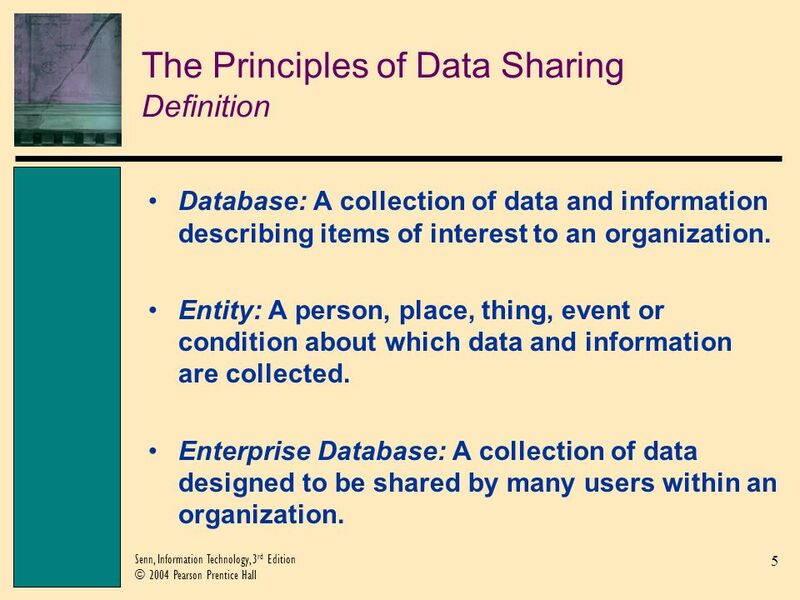 5 5 Senn, Information Technology, 3 rd Edition © 2004 Pearson Prentice Hall The Principles of Data Sharing Definition Database: A collection of data and information describing items of interest to an organization. 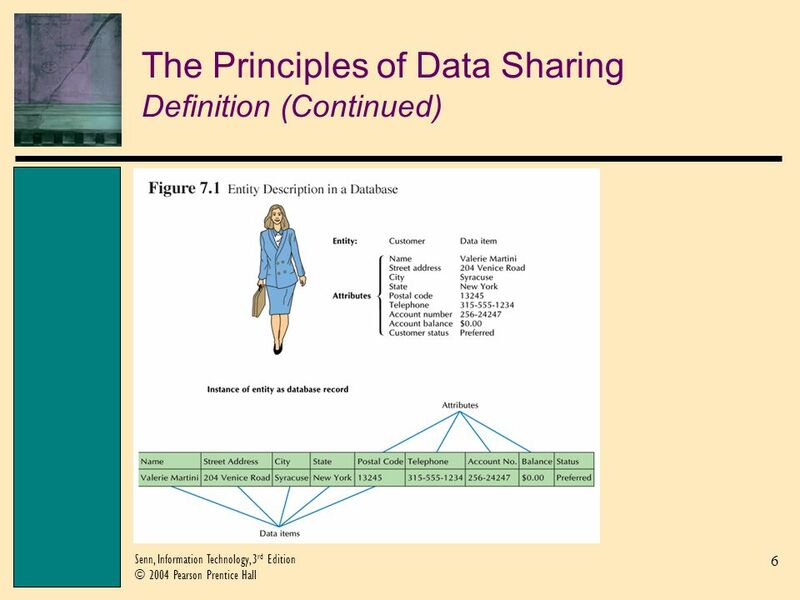 Entity: A person, place, thing, event or condition about which data and information are collected. 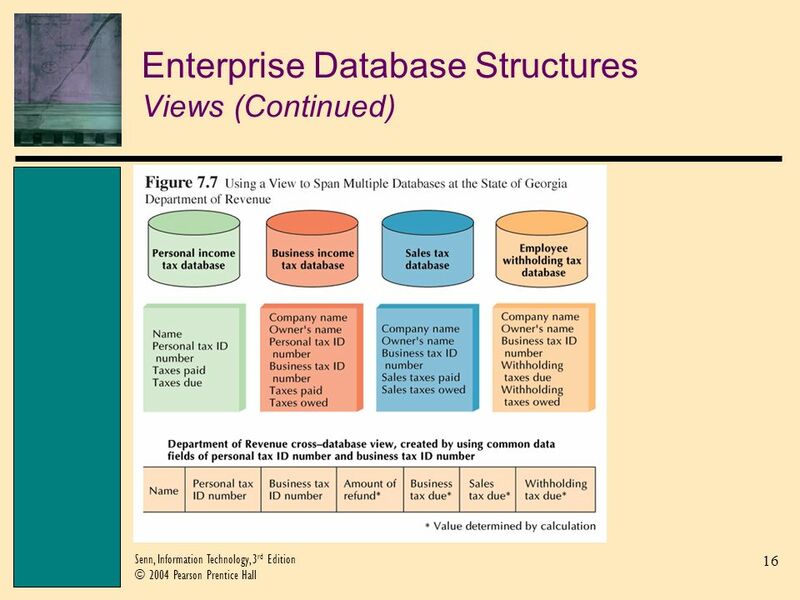 Enterprise Database: A collection of data designed to be shared by many users within an organization. 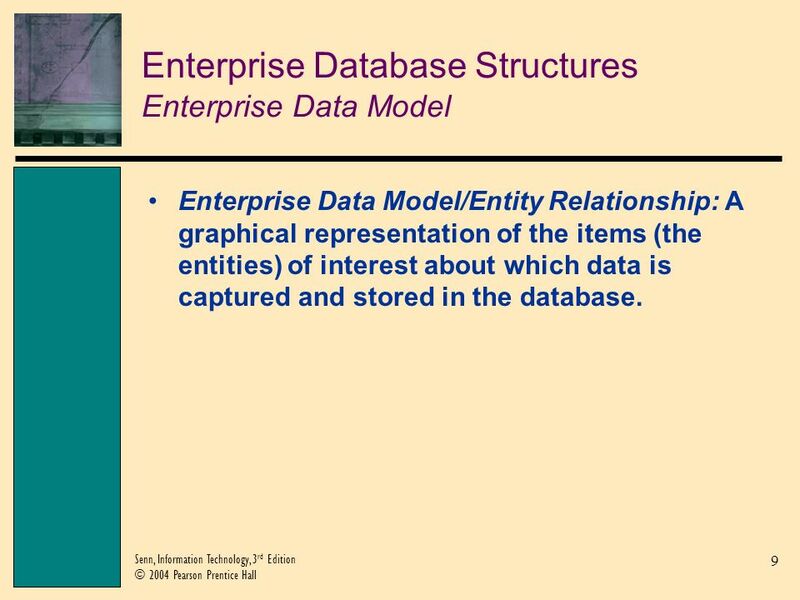 9 9 Senn, Information Technology, 3 rd Edition © 2004 Pearson Prentice Hall Enterprise Database Structures Enterprise Data Model Enterprise Data Model/Entity Relationship: A graphical representation of the items (the entities) of interest about which data is captured and stored in the database. 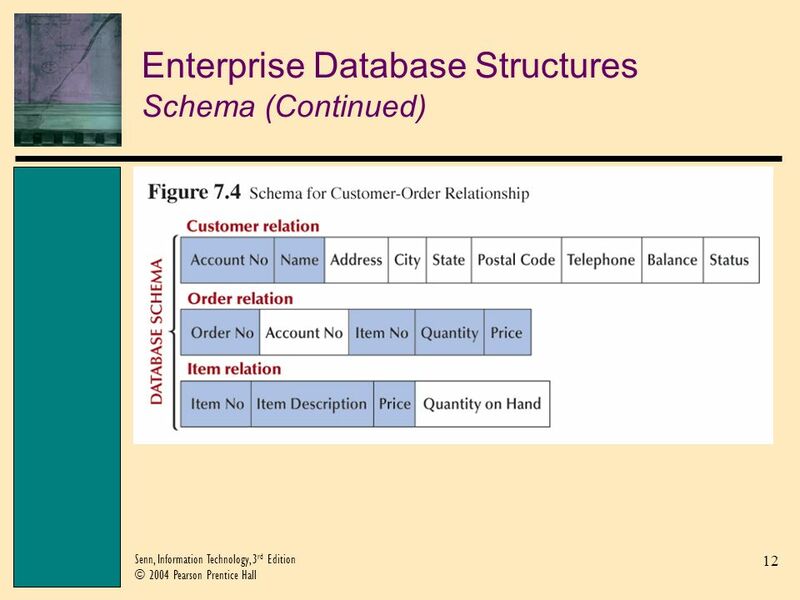 11 11 Senn, Information Technology, 3 rd Edition © 2004 Pearson Prentice Hall Enterprise Database Structures Schema Schema: The structure of a database. 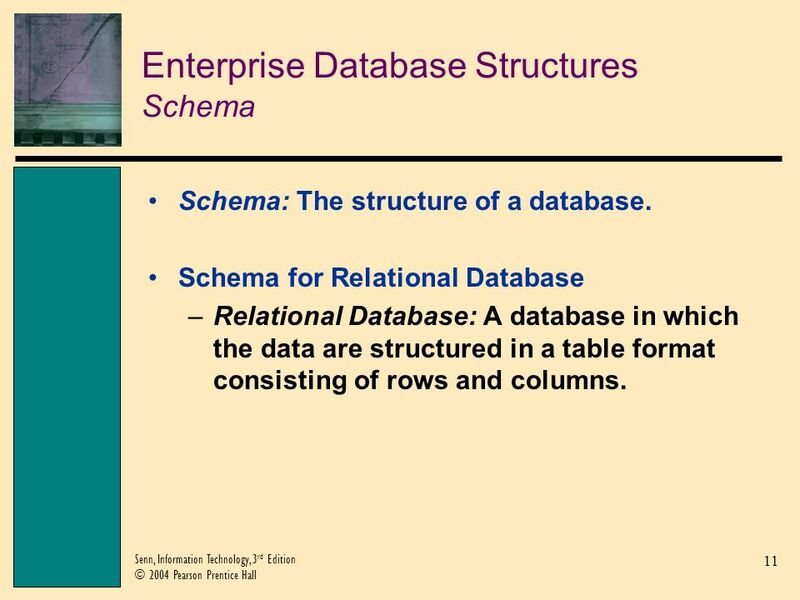 Schema for Relational Database –Relational Database: A database in which the data are structured in a table format consisting of rows and columns. 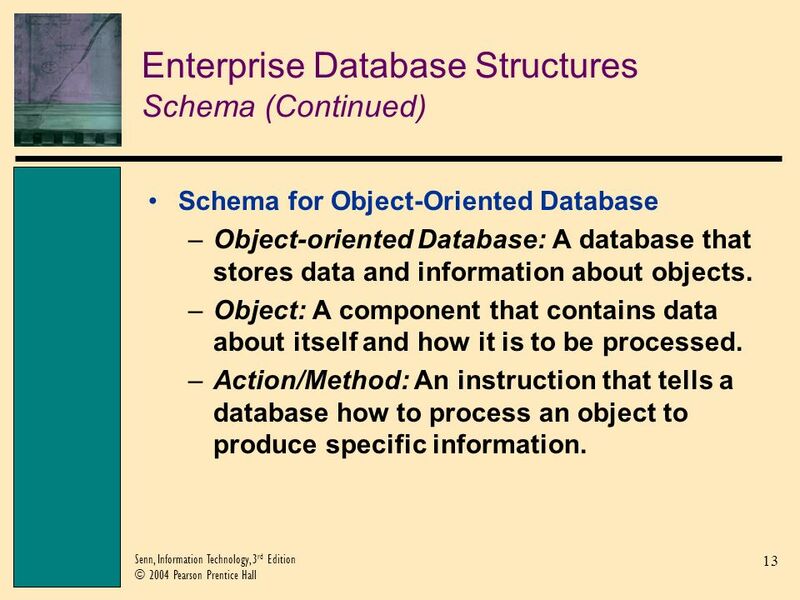 13 13 Senn, Information Technology, 3 rd Edition © 2004 Pearson Prentice Hall Enterprise Database Structures Schema (Continued) Schema for Object-Oriented Database –Object-oriented Database: A database that stores data and information about objects. –Object: A component that contains data about itself and how it is to be processed. –Action/Method: An instruction that tells a database how to process an object to produce specific information. 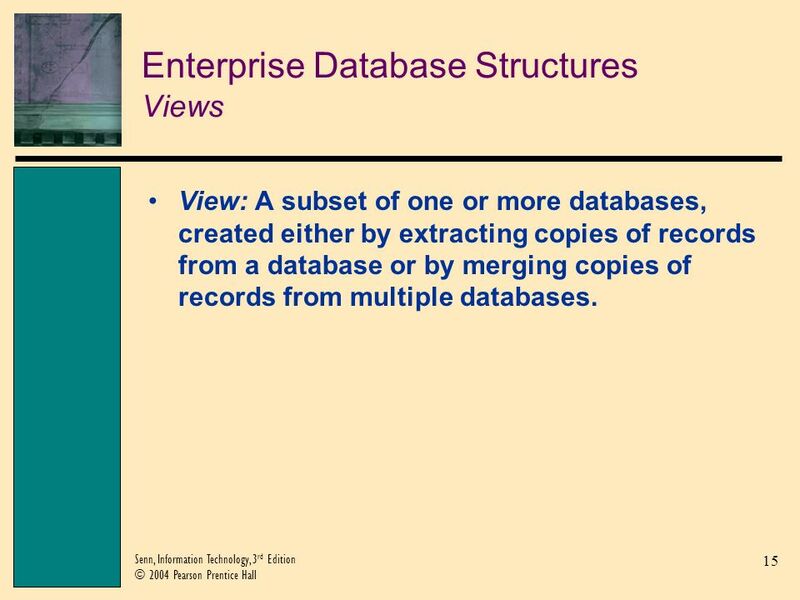 15 15 Senn, Information Technology, 3 rd Edition © 2004 Pearson Prentice Hall Enterprise Database Structures Views View: A subset of one or more databases, created either by extracting copies of records from a database or by merging copies of records from multiple databases. 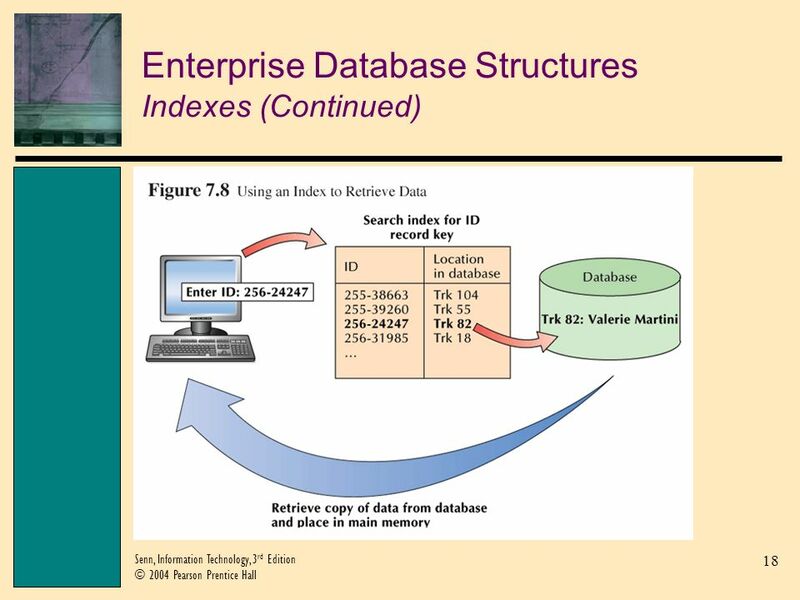 17 17 Senn, Information Technology, 3 rd Edition © 2004 Pearson Prentice Hall Enterprise Database Structures Indexes Index: A data file that contains identifying information about each record and its location in storage. 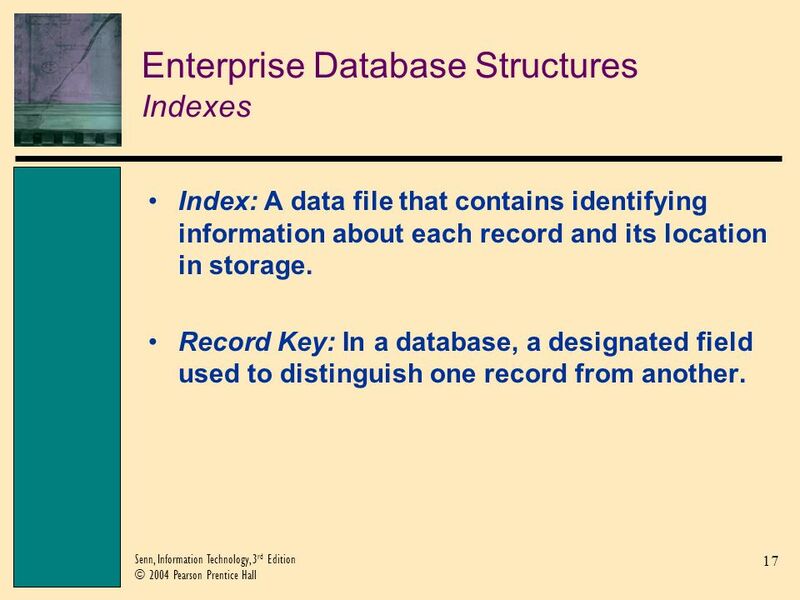 Record Key: In a database, a designated field used to distinguish one record from another. 19 19 Senn, Information Technology, 3 rd Edition © 2004 Pearson Prentice Hall Client/Server Computing Definition File Server: A computer containing files that are available to all users interconnected on a local area network. 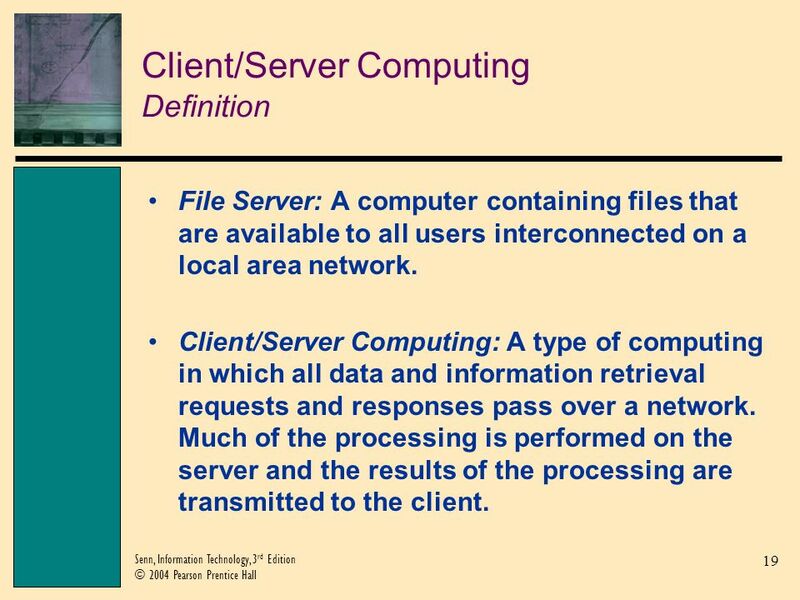 Client/Server Computing: A type of computing in which all data and information retrieval requests and responses pass over a network. 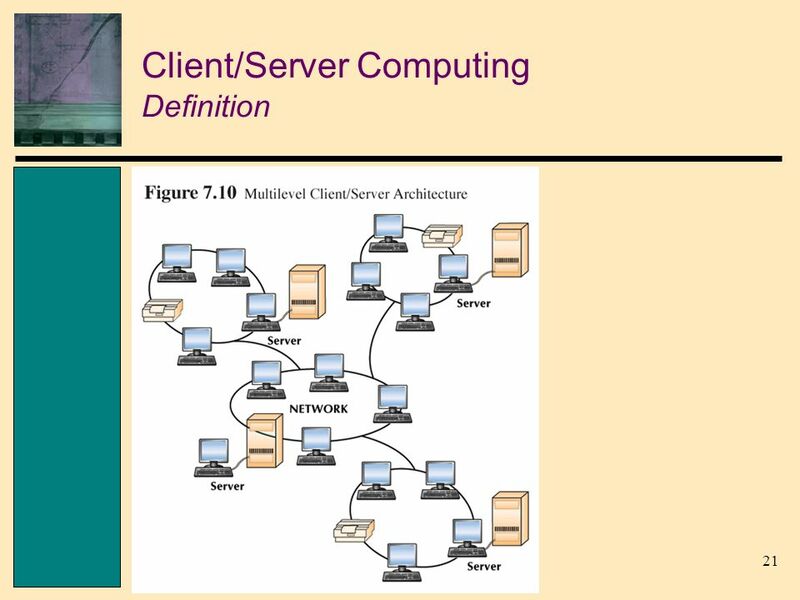 Much of the processing is performed on the server and the results of the processing are transmitted to the client. 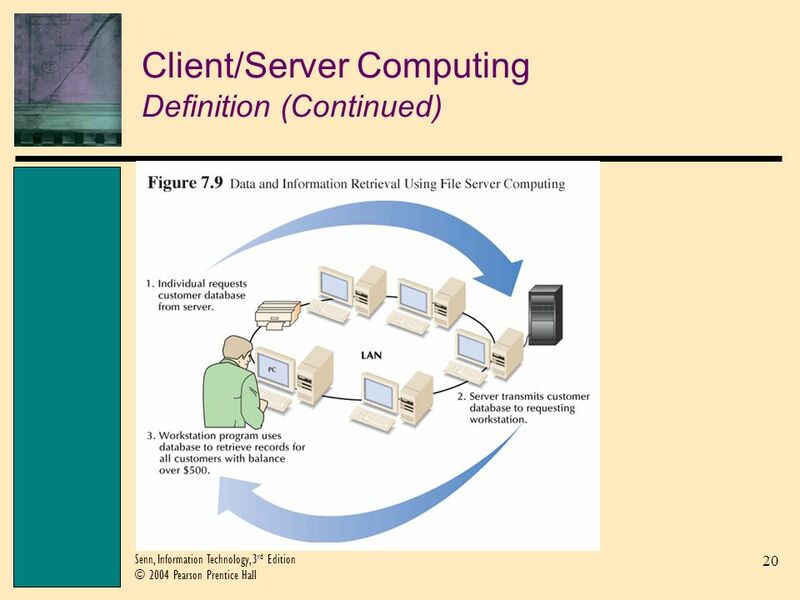 22 22 Senn, Information Technology, 3 rd Edition © 2004 Pearson Prentice Hall Client/Server Computing Definition (Continued) Client: In client-server computing, a desktop workstation. 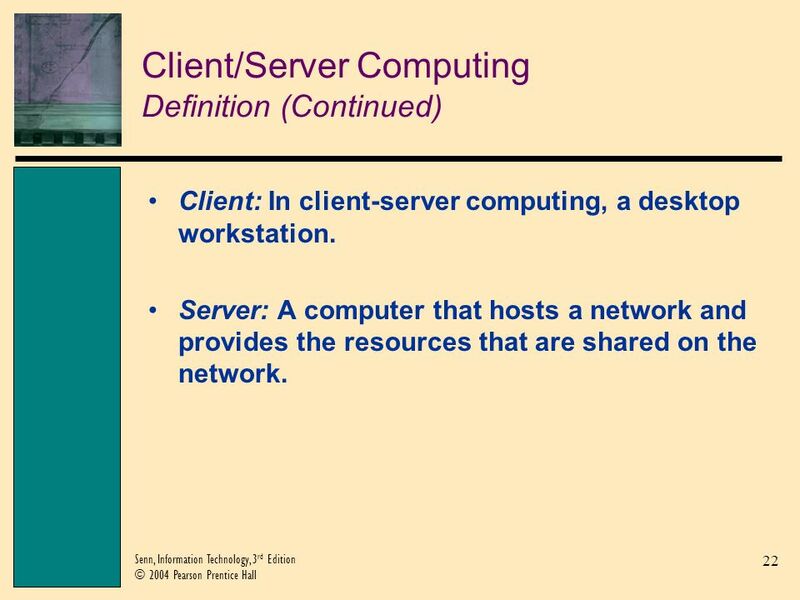 Server: A computer that hosts a network and provides the resources that are shared on the network. 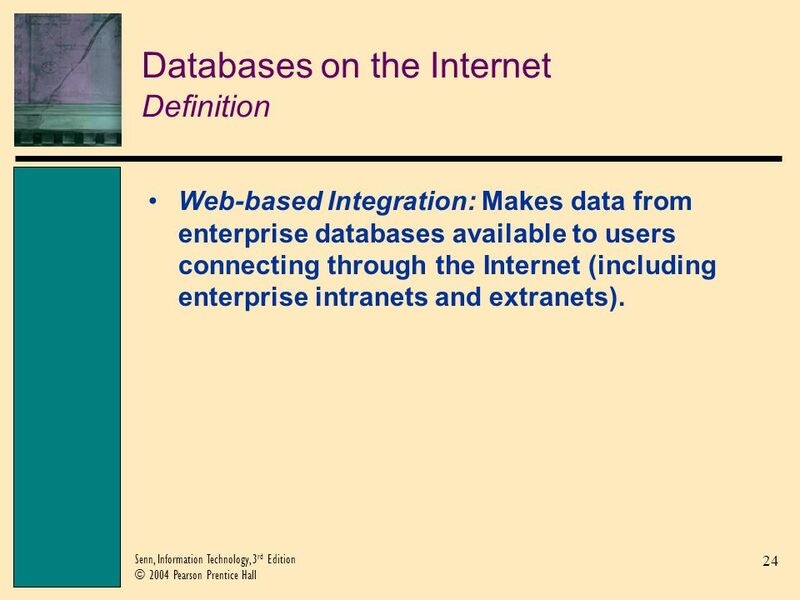 24 24 Senn, Information Technology, 3 rd Edition © 2004 Pearson Prentice Hall Databases on the Internet Definition Web-based Integration: Makes data from enterprise databases available to users connecting through the Internet (including enterprise intranets and extranets). 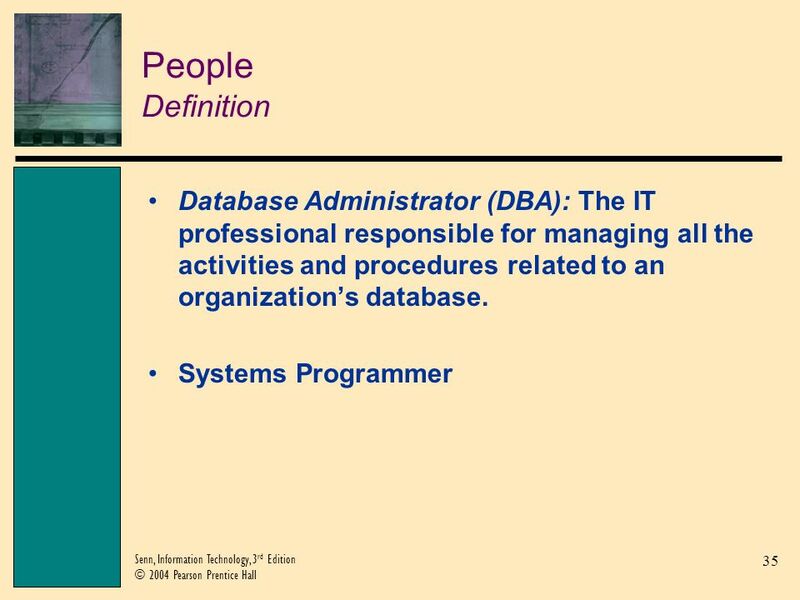 26 26 Senn, Information Technology, 3 rd Edition © 2004 Pearson Prentice Hall Distributed Databases Definition Shared Database: A database shared among many users and applications. 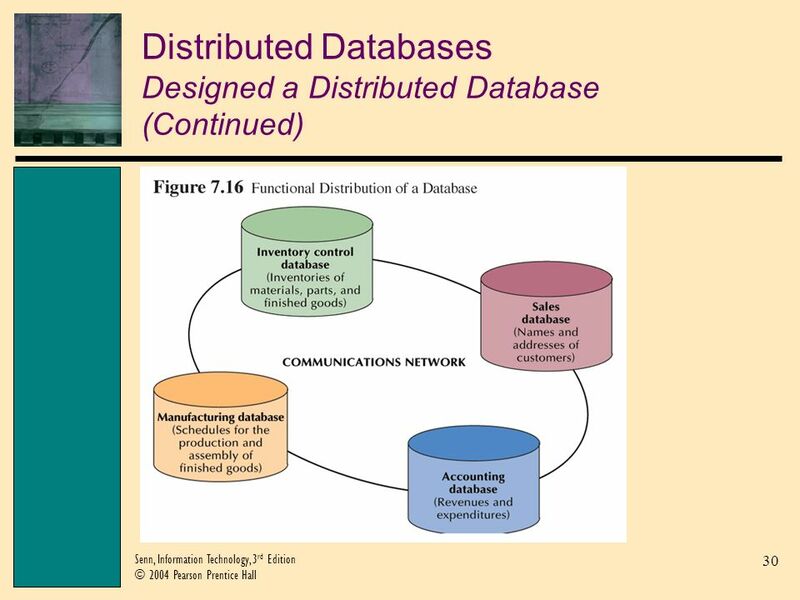 Distributed Database: A database that resides in more than one system in a distributed network. Each component of the database can be retrieved from any node in the network. 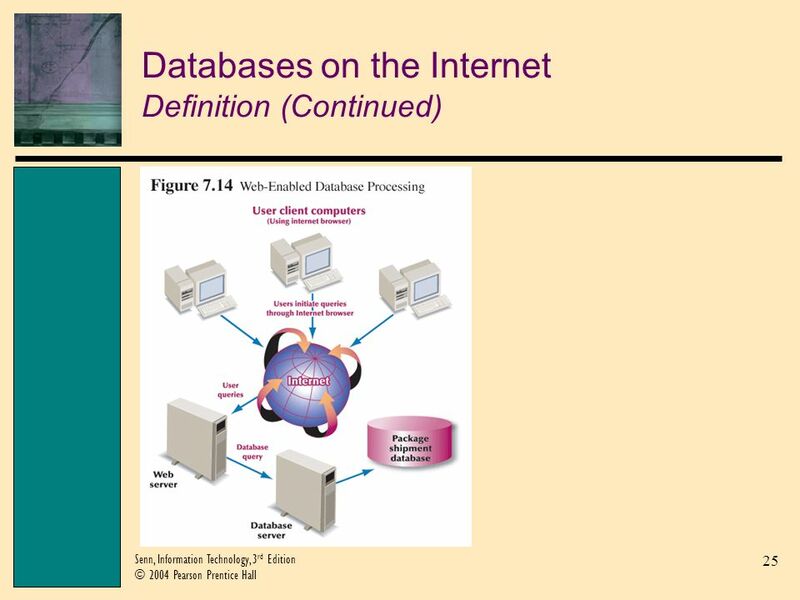 27 27 Senn, Information Technology, 3 rd Edition © 2004 Pearson Prentice Hall Distributed Databases Partitioning and Replication Partitioning: A method of database distribution in which different portions of the database reside at different nodes in the network. 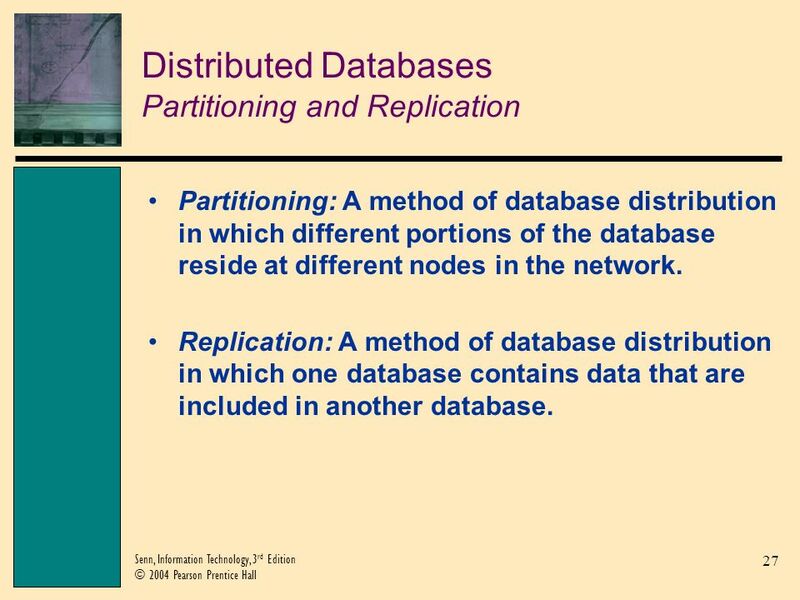 Replication: A method of database distribution in which one database contains data that are included in another database. 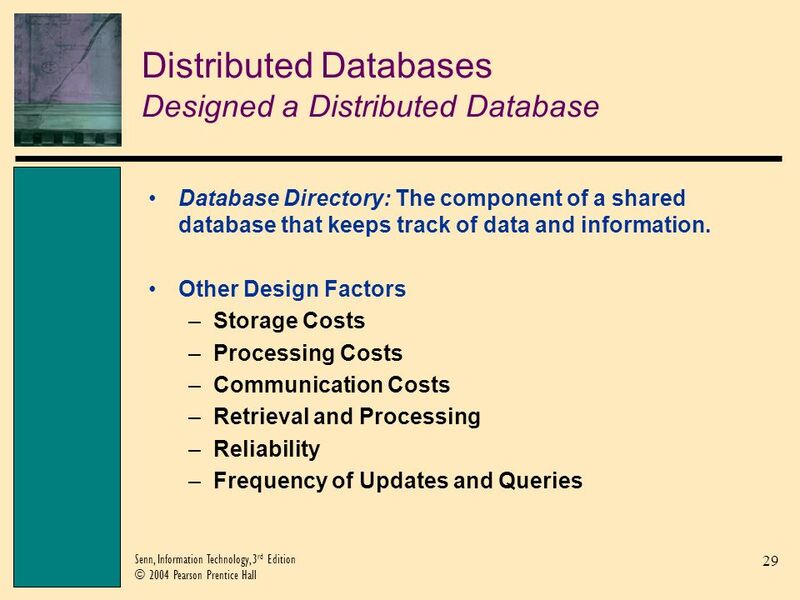 28 28 Senn, Information Technology, 3 rd Edition © 2004 Pearson Prentice Hall Distributed Databases Distribution Strategies Geographic Distribution Strategy: A database distribution strategy in which the database is located in a region where the data and information are used most frequently. 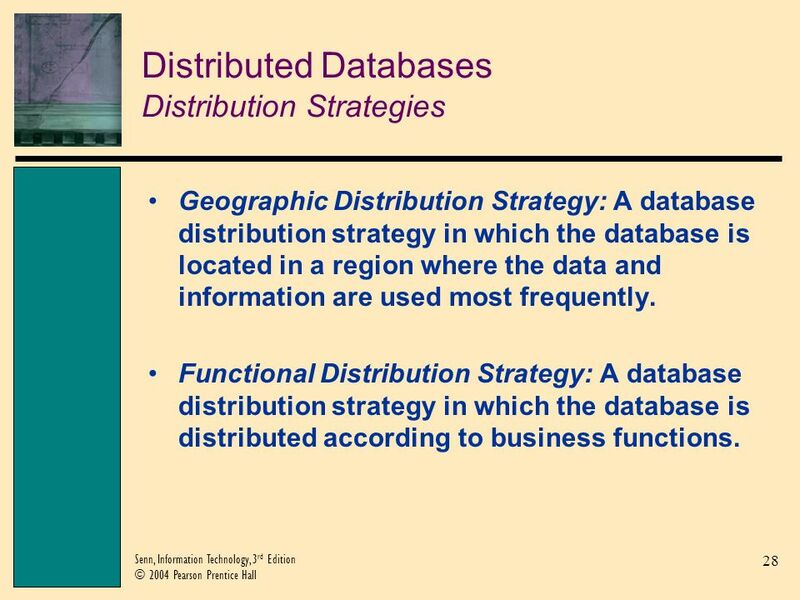 Functional Distribution Strategy: A database distribution strategy in which the database is distributed according to business functions. 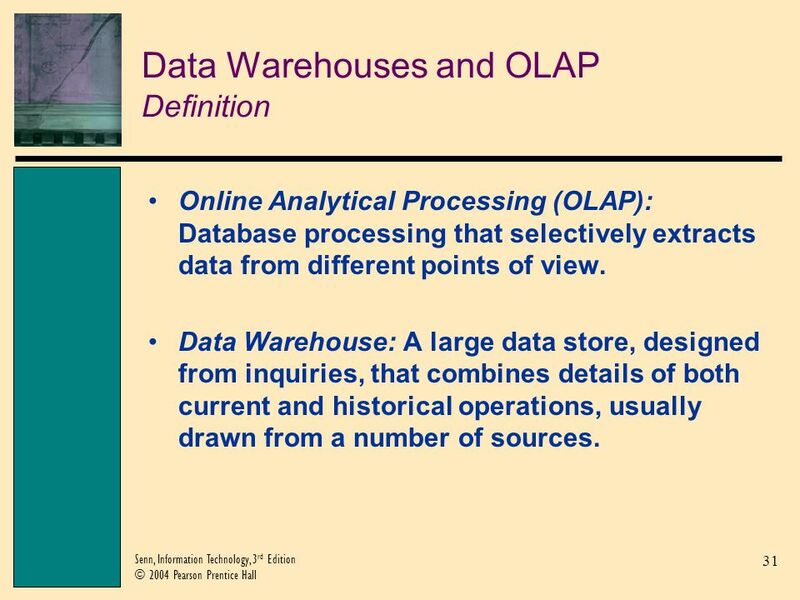 31 31 Senn, Information Technology, 3 rd Edition © 2004 Pearson Prentice Hall Data Warehouses and OLAP Definition Online Analytical Processing (OLAP): Database processing that selectively extracts data from different points of view. 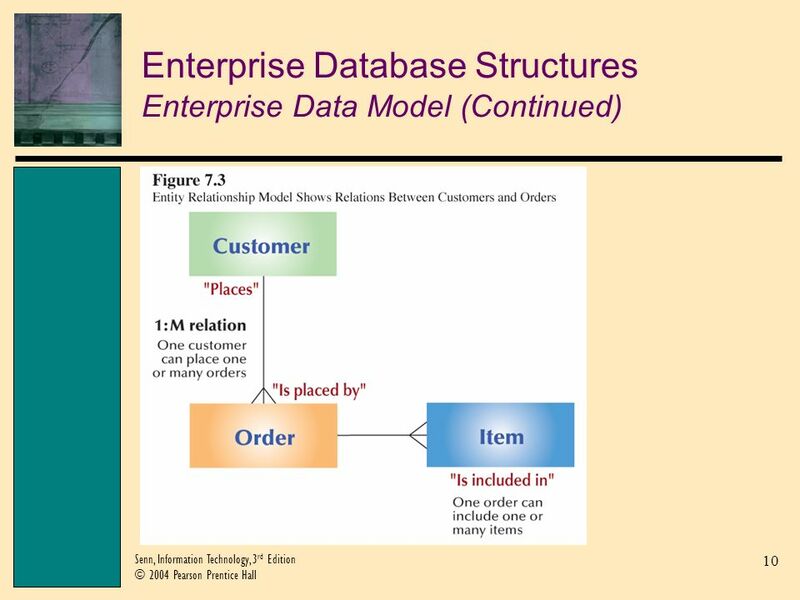 Data Warehouse: A large data store, designed from inquiries, that combines details of both current and historical operations, usually drawn from a number of sources. 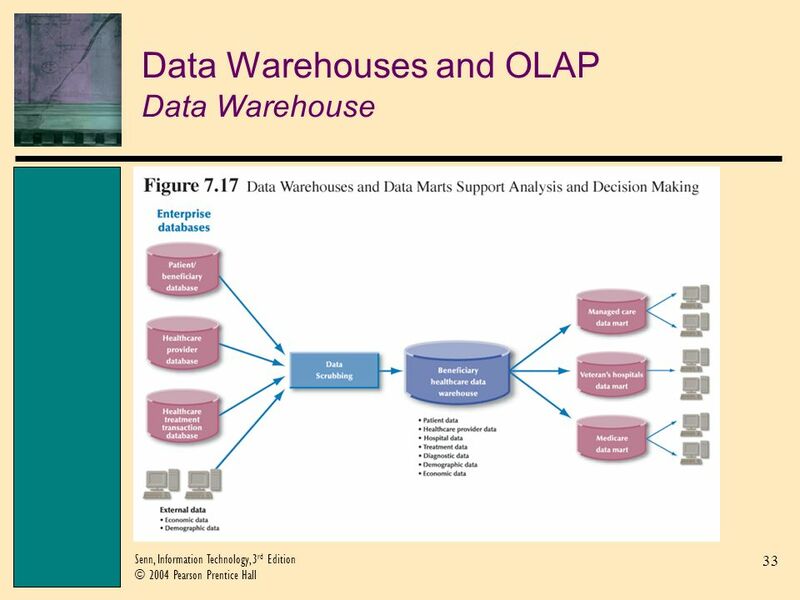 34 34 Senn, Information Technology, 3 rd Edition © 2004 Pearson Prentice Hall Data Warehouses and OLAP Definition Data Mining: Uses software designed to detect information hidden in the data. 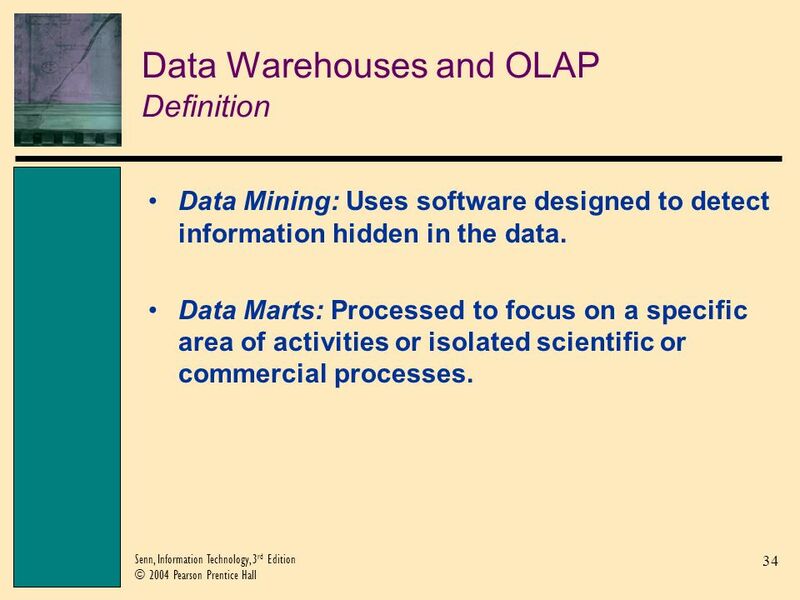 Data Marts: Processed to focus on a specific area of activities or isolated scientific or commercial processes. 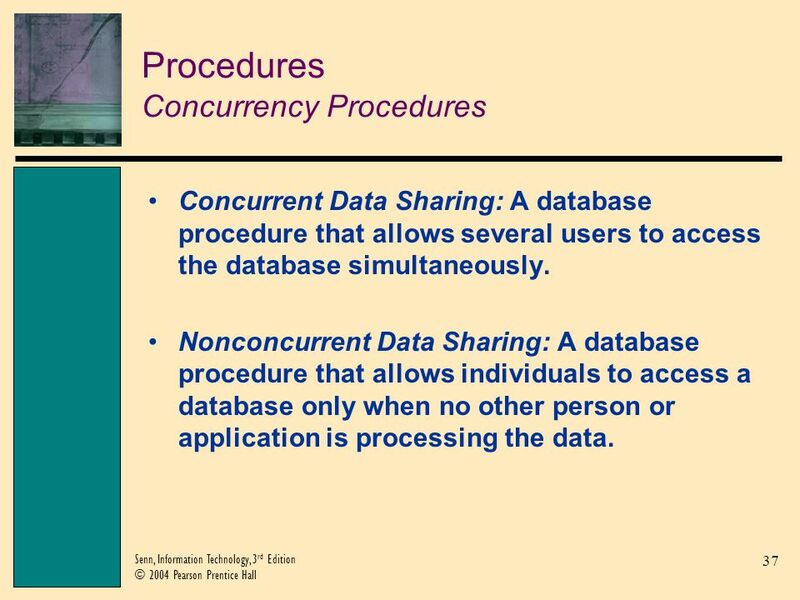 37 37 Senn, Information Technology, 3 rd Edition © 2004 Pearson Prentice Hall Procedures Concurrency Procedures Concurrent Data Sharing: A database procedure that allows several users to access the database simultaneously. 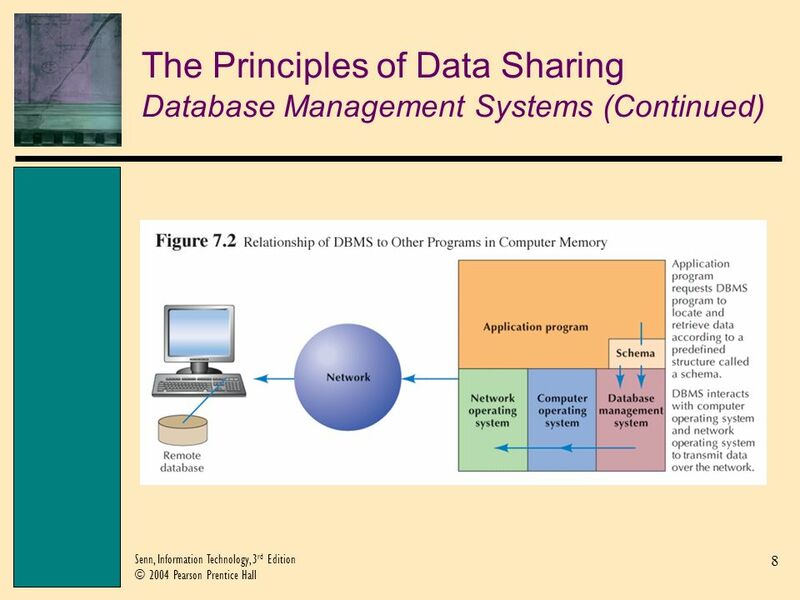 Nonconcurrent Data Sharing: A database procedure that allows individuals to access a database only when no other person or application is processing the data. 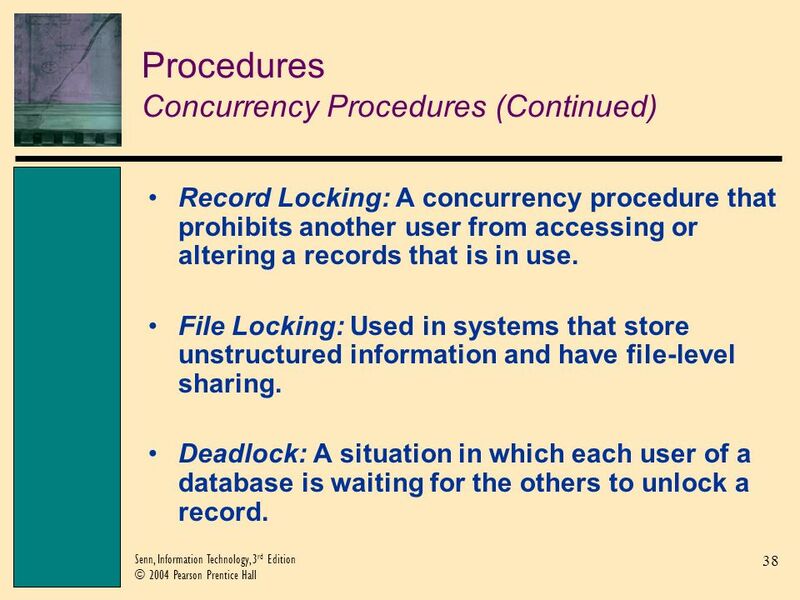 38 38 Senn, Information Technology, 3 rd Edition © 2004 Pearson Prentice Hall Procedures Concurrency Procedures (Continued) Record Locking: A concurrency procedure that prohibits another user from accessing or altering a records that is in use. File Locking: Used in systems that store unstructured information and have file-level sharing. Deadlock: A situation in which each user of a database is waiting for the others to unlock a record. 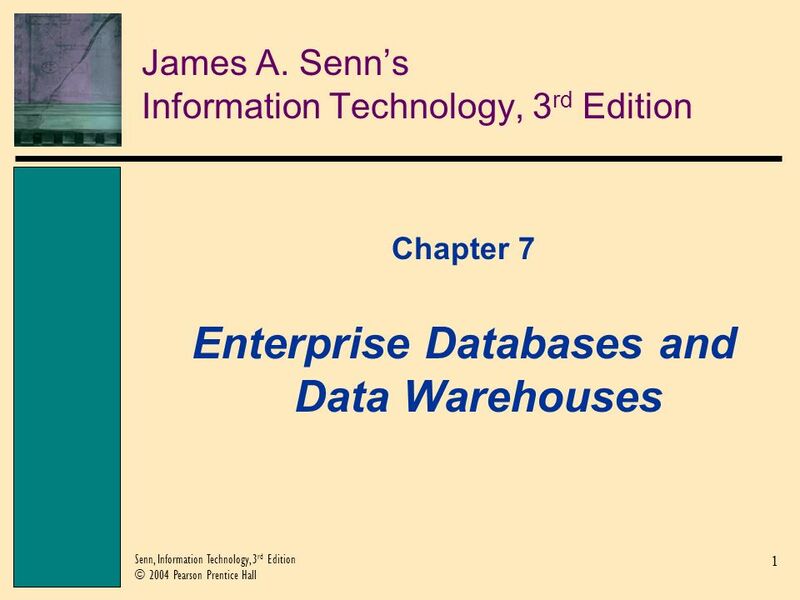 Download ppt "1 Senn, Information Technology, 3 rd Edition © 2004 Pearson Prentice Hall James A. Senns Information Technology, 3 rd Edition Chapter 7 Enterprise Databases."